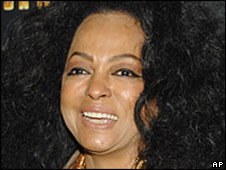 Singer Diana Ross will headline the Nobel Peace Prize Concert in December, organisers confirm. 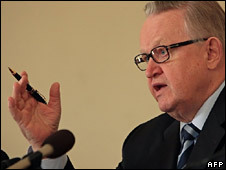 The event, which is held a day after the Nobel awards ceremony, is staged in honour of the 2008 Laureate, Finnish peace mediator Martti Ahtisaari. US country singer Dierks Bentley and Canadian star Feist will also perform. Geir Lundestad of the Norwegian Nobel Committee said: "It promises to be a spectacular evening and we encourage everyone to tune in and join us." However, a Supremes reunion for the concert has been ruled out. Former backing singer Mary Wilson told BBC News she had not been approached. "Everyone asks me that, I always tell them go and tell Diana about that and if she says yes I'll do it. "There's nothing planned as far as I know, they've not come and asked me yet," she said. Mexican singer-songwriter Julieta Venegas, Nigerian star Seun Kuti, and Norway's popular singer-songwriter Marit Larsen have also been lined up to perform. "The Nobel Committee is thrilled to welcome such an impressive array of mindful and talented artists to help us spread the message of peace around the world," Mr Lundestad said. Ross was married to the late Norwegian millionaire Arne Naess Jr from 1985. They had two children together, but they divorced in 2000. He died in a mountain climbing accident four years later. The show, which takes place on 11 December, is usually hosted by Hollywood stars. Details of this year's presenters have not been confirmed yet. Last year Uma Thurman and Kevin Spacey acted as hosts.